Cordello Home was founded in 2014 by Kate Shaw and reflects her love of graphic design, mid-century furniture, eclectic interiors and vibrant home and household objects. The name is inspired by her fascination with all things Italian: the country, the food, the people and of course, the style! Cordello Home was born out of two Italian words: 'cuore' (heart) and 'modello' (pattern). From a very early age, Kate’s homelife was surrounded and influenced by design and ten years ago, she started (and continues to run) a graphic design agency, making Cordello Home a very natural and exciting progression into the world of homewares and lifestyle products. The patterns are all created using an iconic heart symbol, embracing the use of colour and bringing vibrancy, fun and passion into your home. All of the products are designed and produced in the UK, supporting other British businesses. Cordello Home, the heart of homewares. If you want to create a statement dinner party setting, our large olive green placemat is the perfect centre piece that will protect your table. 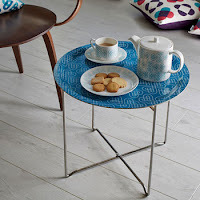 This stunning tray table is design and function at its very best; a tray which sits neatly on top of a collapsible chrome stand. 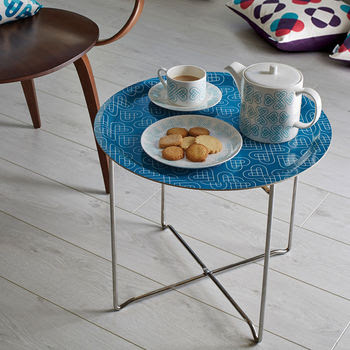 This superbly practical piece of furniture can be a permanent fixture in your room as a side table, or if you are short on space - tucked discreetly away and brought out on demand. 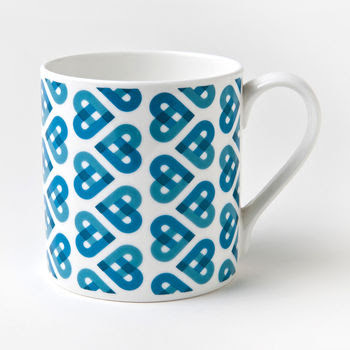 For those with a passion for homewares and hot drinks, the Cordello Heart mug was designed with you in mind. 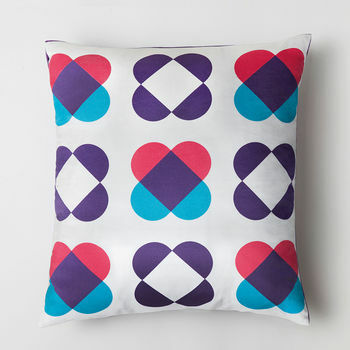 The Cross my Heart cushion is printed on 100% cotton satin fabric and has a solid purple back. Supplied with a 100% duck feather pad, the cushion has an envelope back.